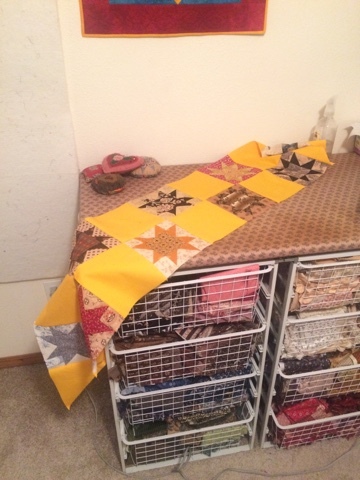 I got my little quilt from the World Piece fabric basted and ready to quilt. 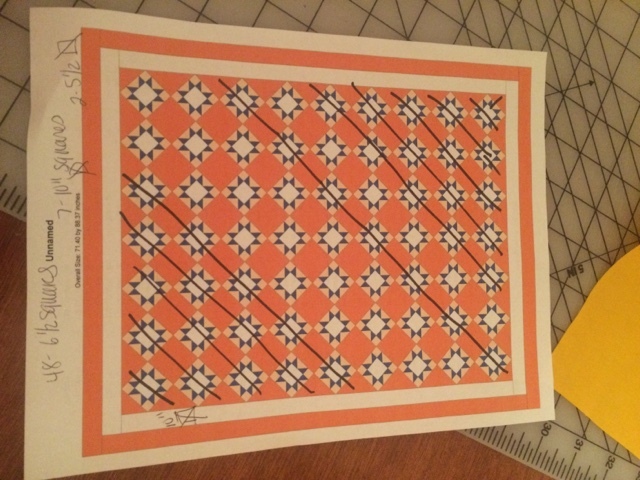 I plan on quilting this one by machine. 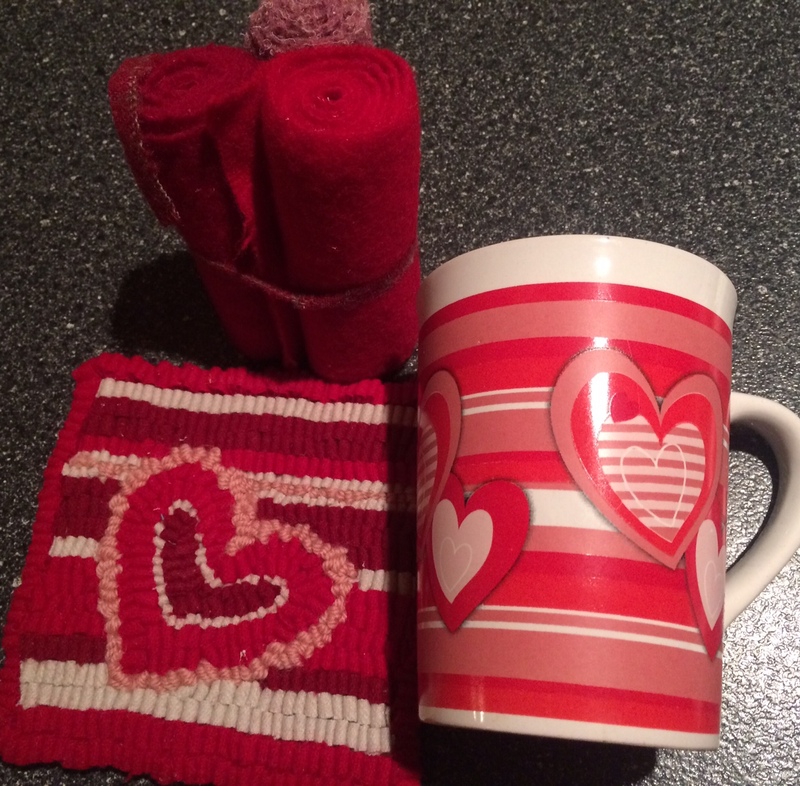 If you are a regular reader of my blog you may get a chance to win it when it is completed! Keep your eyes open for further details. A little over a week ago I had to go into Portland. Of course, this is one of my regular stops. I saw this cute window display. So much of this line I didn't see when I was working with my "India" bundle. They are so darn adorable! See all of the fabric HERE. 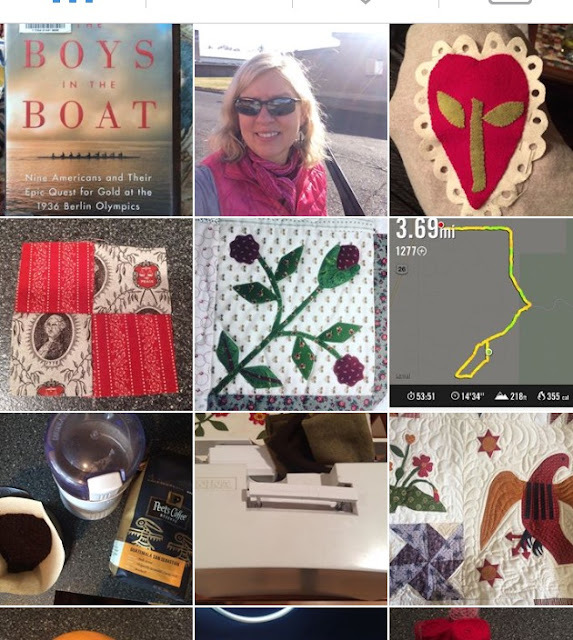 Since I have sewn hardly a stitch the past few days I thought I'd introduce you to a few blogs you may not be familiar with. It's easy (for me) to stay in the same blogging circles. Michelle- A machine! What more can I say?! Okay, yes lots of gorgeous quilts here!! Nathalie- Her blog name translated is Magic Needle- pay her a visit for a little magic in your life! Julia- Is making a quilt with vintage lace and amazing hand quilting. I hope you'll make your rounds when you get a few minutes. Leave a comment of encouragement. That's always nice! I certainly appreciate every single comment you leave! I haven't had the time lately to respond- so sorry!! 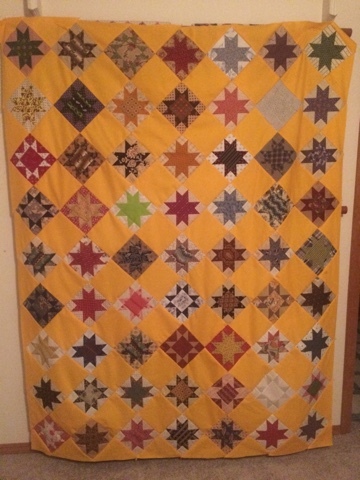 Here is the other quilt that Sharon quilted for me. I'm calling it High Desert Baskets. Wendy, from Legends and Lace shared these challenging basket blocks some time ago. I see she is doing another monthly BOM called red and green. Check it out HERE. While trimming it to prep it for the binding I had to take a close look to see if I had appliqued by hand or machine! LOL It was machine, btw. This lovely traditional wreath is on the setting squares. I'm usually sewing on the weekend but my kids are here and my son leaves next Monday (the 1st ) for his world travels. I want to spend as much time as possible with him while he is here. There will be time to sew.....next weekend! I won a give away from Gayle, The Middle Sister blog. Thank you Gayle! I just love it!!! I used a few different background pieces as I think it ages the quilt nicely. 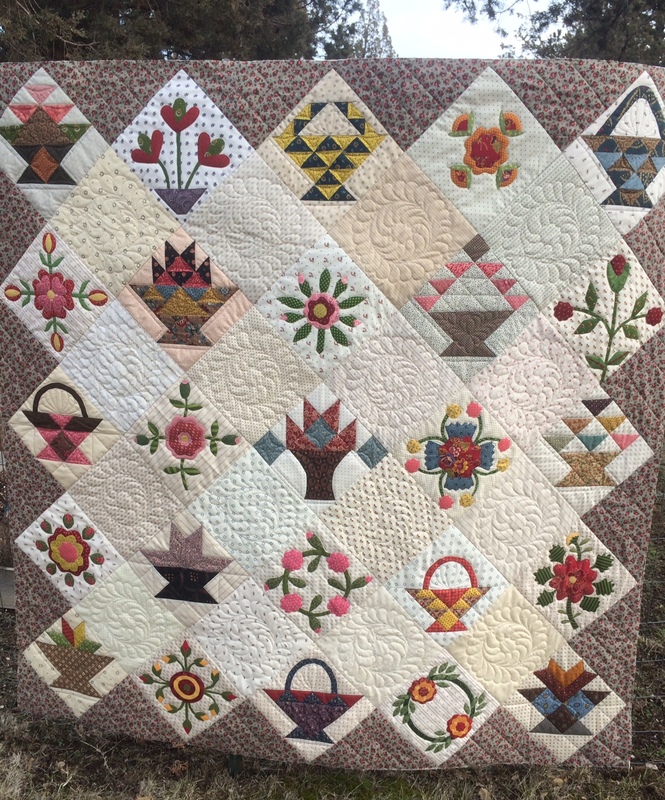 I still can't get enough of Sharon's beautiful quilting. Mostly I'm plugging away for an hour or so in the evening handquilting. I haven't had time this week to do any more than sew on the binding. Looking forward to the weekend!! 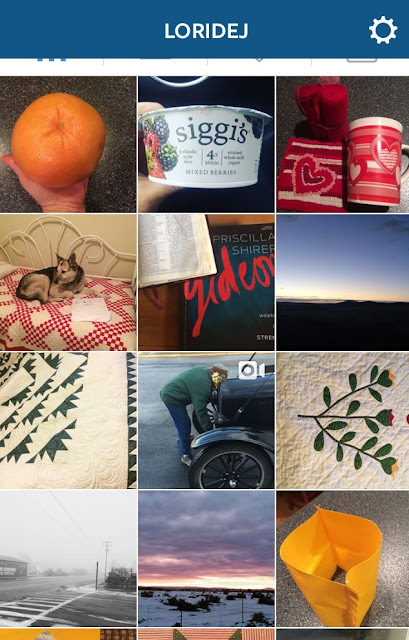 And if you are interested, here is my Instagram feed for this week. Most of you will probably recognize this quilt. 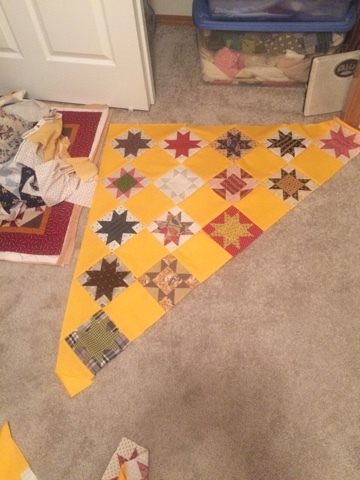 This is the quilt top I made from Fat Quarter shop vintage and classic block series. I got it back from the quilter this week. It was my first time sending out to Sharon, Grass Roots Quilt Studio, but I had seen her work and knew we would be on the same page. We had a facetime conversation and it worked out great as she was able to show me a few different classic options of quilting. I wanted to keep this one very traditional. We also have had masses of rain so there was no hanging this one outside for photos. This photo was my inspiration. 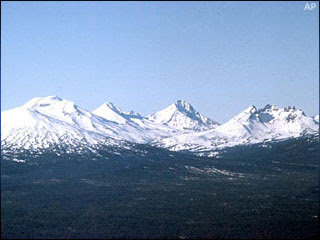 I get to see these mountains on a regular basis. So, I printed what I wanted on paper. A sprayed lightly with a clear coat, then washed it to check the stability. I will attach my binding, then applique the other two sides of this label. I'm actually pretty thrilled with how it turned out. Thanks Lizzy- Gone to the Beach blog. Gay at Sentimental Stitches is reproducing a sampler she owns and here are my first 3 blocks. 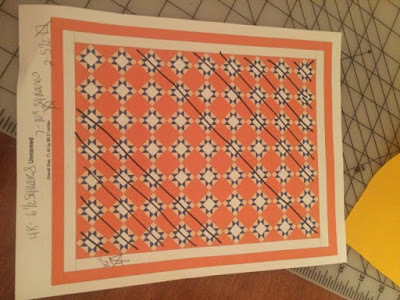 I'm appliqueing the main block, then trimming to 10 1/2"
Ironing creases on the diagonal for corner diamond placement. The eye- balling about 1/2" and applying them here. It was dark by the time I took these photos last night so my background fabric looks different. I'm using Moda Bella solid in Fig Tree Cream. And I'm machine appliqueing with a tiny zig zag stitch in matching thread. I gave up at 9 blocks on Benjamin Biggs, but I think I'll find these more interesting. Anybody else sewing along? 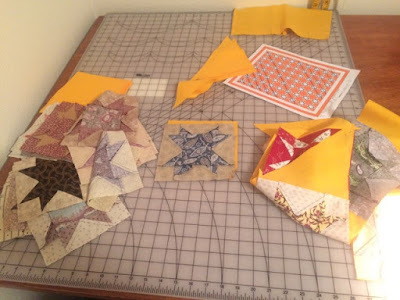 I found this photo online (sorry I cannot trace it back to the owner or the photographer) and it was the inspiration quilt for my Stars in a Time Warp. (The antique quilt is (was?) owned by Vintage Blessings. She has a shop on EBay and a FB page. If I recall correctly, she showed the cheddar star picture on FB and said she didn't know if she could let that one go. I haven't seen it for sale but I might have missed it. Someone must have copied her photo and put it on Pinterest without attribution.) Thanks Taryn!! I got mine outside today to snap a few photos in the natural light. 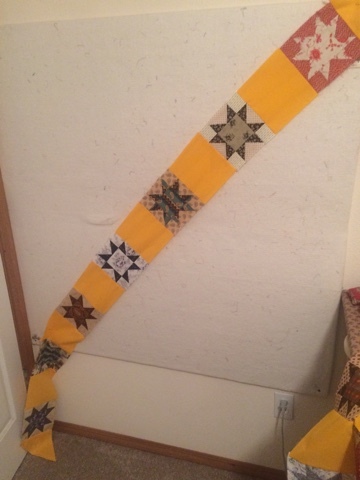 My top and bottom border have a slightly different cheddar fabric. I changed the quilt setting after I calculated how much fabric I would need. I like the change anyway. It was sprinkling out so the quilt is a little wet, not dirty. 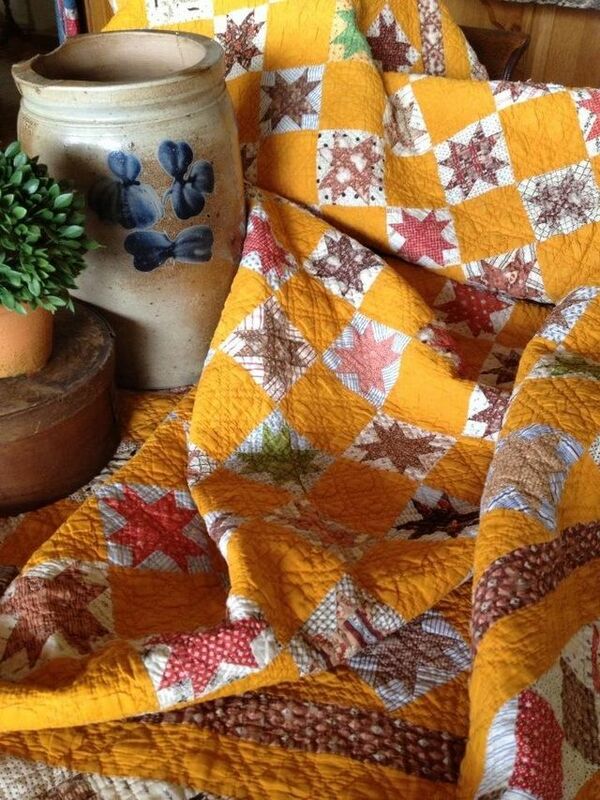 Will have to mull over quilting ideas before I commit to anything. I will not be hand quilting this one, since my cherry tree quilt is my one large hand project and it is enough. Thank you Barbara for the wonderful lessons about fabric this past year!! I'll be happily reading along Barbara Brackman's Westering Women series, beginning January 27th. Read more about it HERE. My daughter has been a big part of my sewing and quilting, starting with hanging out inside the quilt stores as a child. 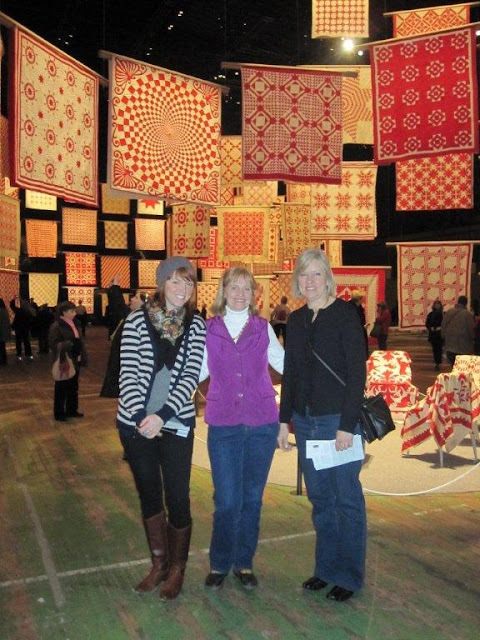 She accompanied me to NYC where we both enjoyed the Infinite Variety quilt show. 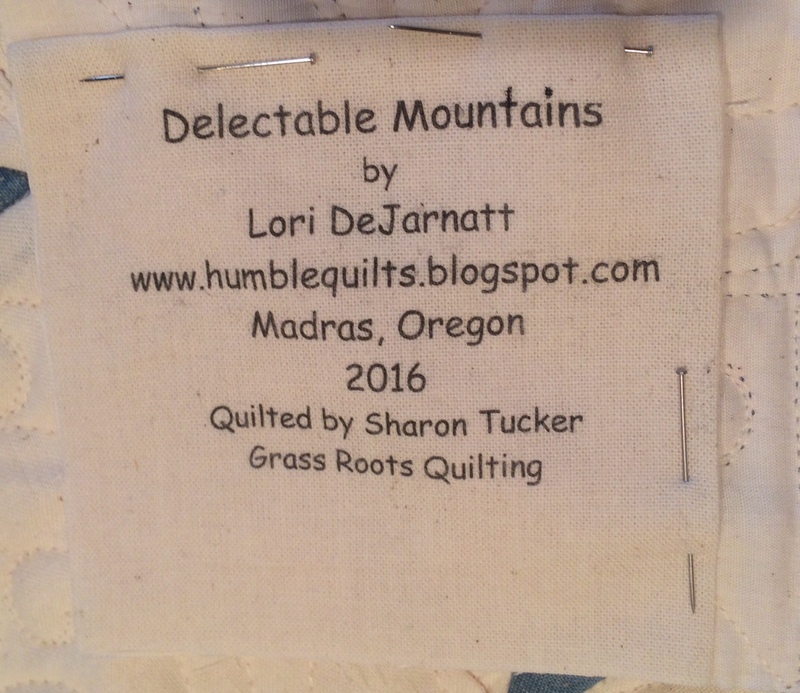 She has had the privilege to meet several of my dear quilting friends. She has browsed textile shops in Paris. 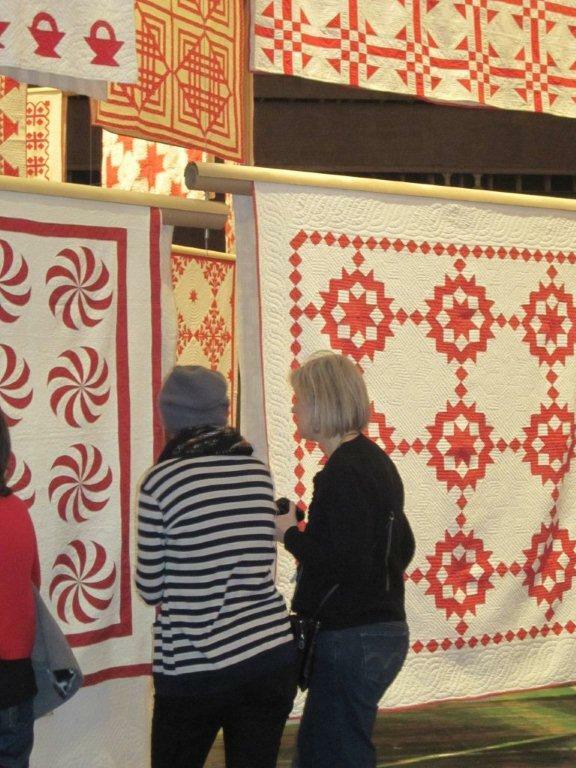 Enjoyed the quilt show in Alsace, France. She has seen rare and beautiful textiles from Beauville. So I guess it wouldn't be too surprising that for Christmas she asked for sewing classes! The Portland Fashion Institute had the perfect class: Learn to Sew 1. Mondays, January 4-25, 6-9 pm OR Tuesdays, January 5-25, 10 am-1 pm OR 6-9 pm. Learn to sew in this first level of beginning sewing. Bring your machine or rent one from us. Learn basic survival stitches — as well as the way professionals sew — while you make an apron. Sew quickly and painlessly. Learn to read and understand commercial patterns. No sewing experience is required. Includes pattern & handouts. Today was her second class and she loves it! She also signed up for a textile lecture and a beginning sashiko class at A Common Thread quilt shop! It is fun to see her show more of an interest. It only took 32 years!! Here it is! It isn't ironed but I was still excited to get this part together. One of my favorite blocks. My sewing room was a bit of a mess. 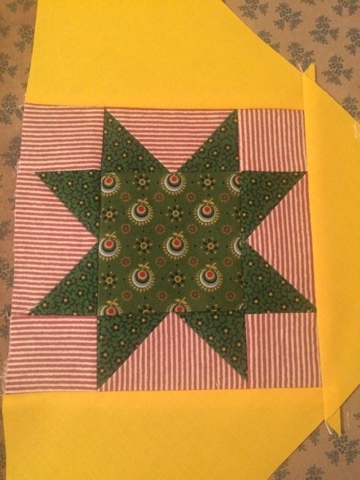 I didn't lay the stars out but just started sewing. And my layout to help keep me on track. Handquilting to Bring in the New Year.